Let’s continue with my guide to Adelaide Central Market. In the previous posts, I’ve covered history of the market, general butchers and poultry butchers. In fact, the market have even more things to be discovered. 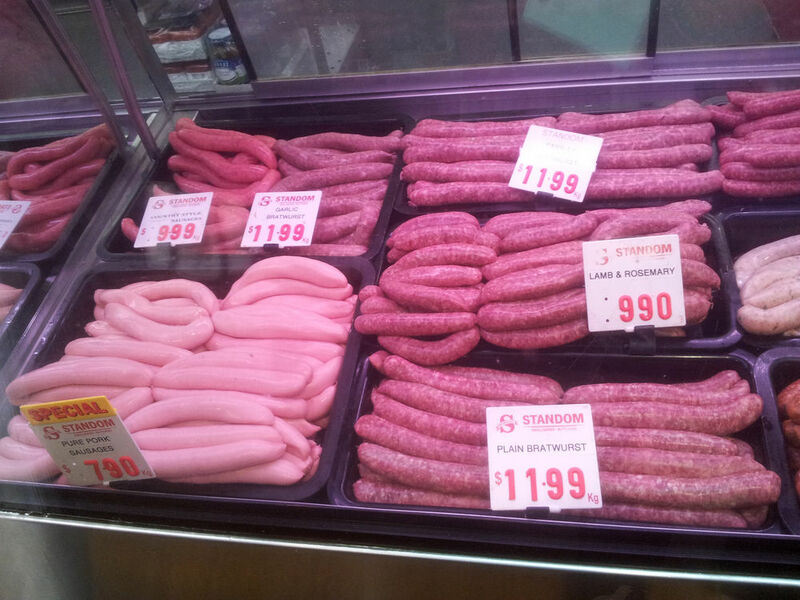 We will update you with some butchers which expertise in sausages and other specialty products. Hopefully this post will be useful for my readers when it comes to decide where to buy products and meats with international culinary influences. When customers come to Adelaide Central Market, except their daily normal diets, many of them just want to experience different cultures. Remember I said the market is a foodie’s heaven? Partially because you can get food and produce from all sorts of cuisines. Located at the rear part of the market facing Gouger street, Marino Meat and Food Store obtained its reputation among shoppers and local foodies. This three-generation family-run business was established in 1975 by the Grandfarther, Mr Antonio Marino and specialises in distributing and producing authentic Italian food and ingredients. With both imported and locally sourced food produce and products, the store is divided into two parts including a butcher area and a deli grocery area. During our conversation, the manager and owner of the store, Mr Riccado Marino specified that for the butcher, all meat were processed on site including the sausages. He also shared that the sausages were made of high quality using traditional and authentic Italian recipes. In turn, they are one of the most popular products for consumers. The sausages were made with no fillers and retail at affordable prices. 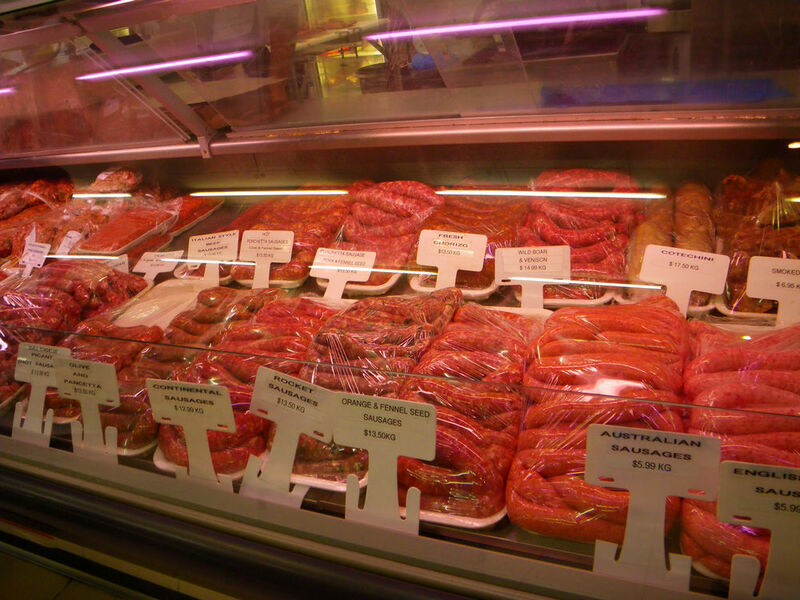 The variety of sausages are vast and market goers can even find sausages made with Australian game meat such as the wild boar and venison sausage. 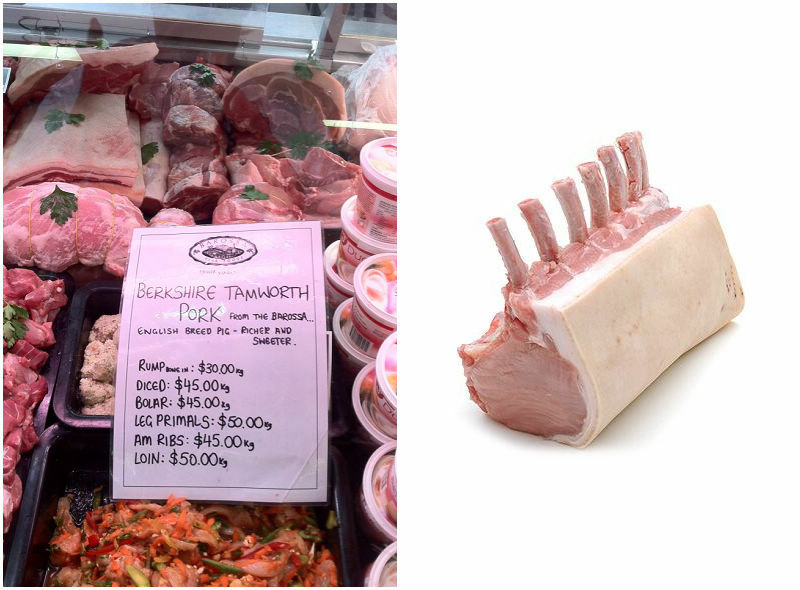 Another very popular butcher item of the store is porchetta, which is a pork roast of Italian culinary tradition. The popularity of their porchetta is extremely high. Every year, Marino Meat pairs up with a winery and has the Porchetta party in September. I was down there last year but was late, the porchetta was finished within half an hour and still had high volume of demands. If you can, make sure to attend the party one year and experience the fantastic combination between Italian food and South Australian produce. The other part of the store is the deli grocery with an emphasis of both imported and locally produced Italian ingredients and condiments. How does the largest Nutella in South Australia sound? Interesting right?! 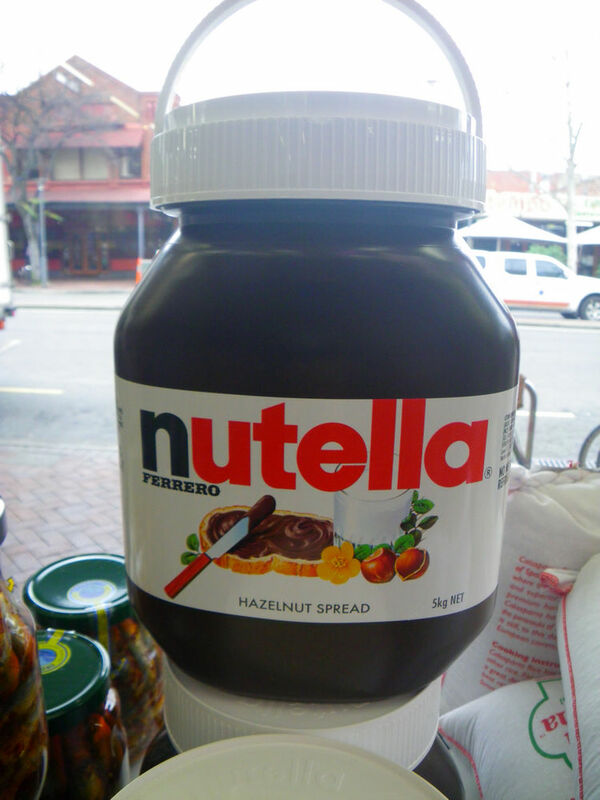 Yes, Marino Meat has the state’s largest Nutella (5 Kg), directly imported from Italy! While I was there, some school kids popped in and started to have photos with the Nutella. What a fun! 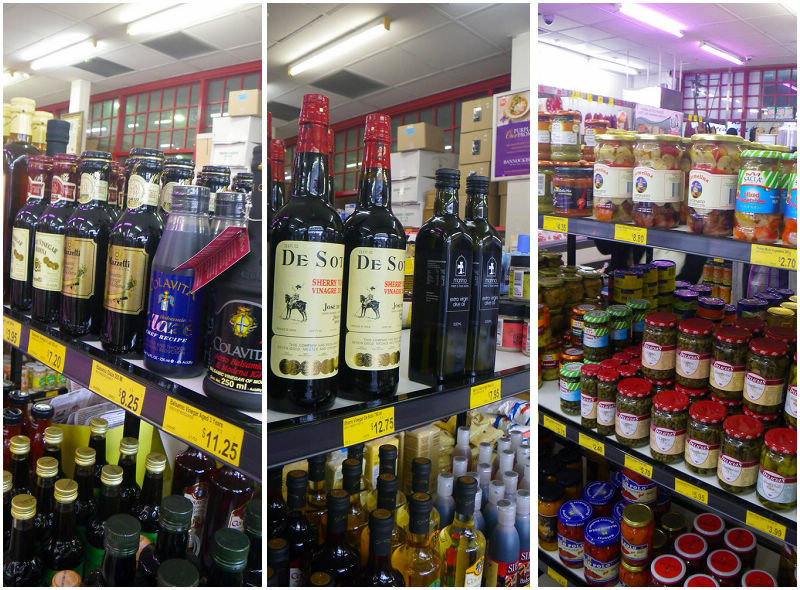 The store has extensive amounts of balsamic and red wine vinegars, produced both in Italy and here in South Australia. The prices are reasonable and one red wine vinegar I found was their own branded 13 years old from McLaren Vale, which was quite impressive to see. There are also a broad range of pickled and preserved fruits an vegs. 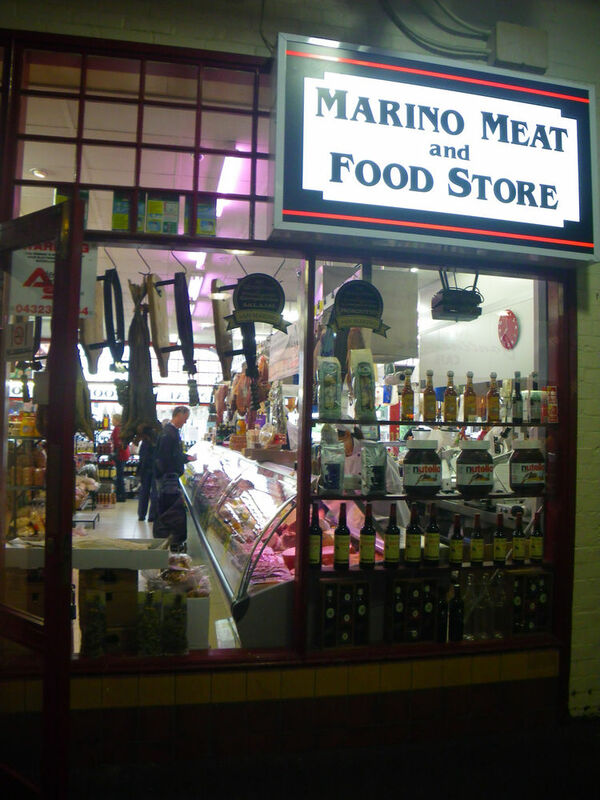 The store also offers smallgoods under the name “San Marino” with varieties such as salami and prosciutto. The store is also experimenting with new Spanish and South American spices and food ingredients. The service of the store staffs is a specialty itself. 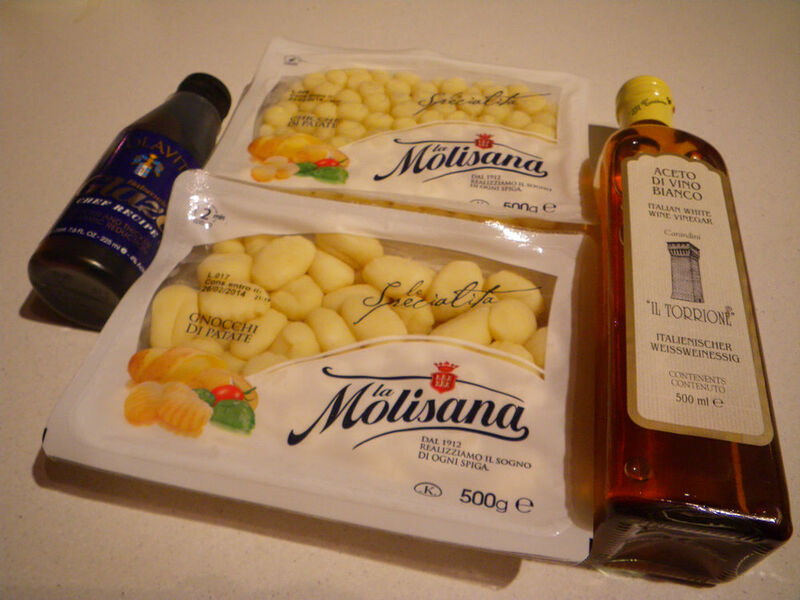 The team was well trained and is knowledgeable on their own products and Italian culinary culture. With the personalised service, I picked up the following item and made my lovely burgers with the balsamic glaze. 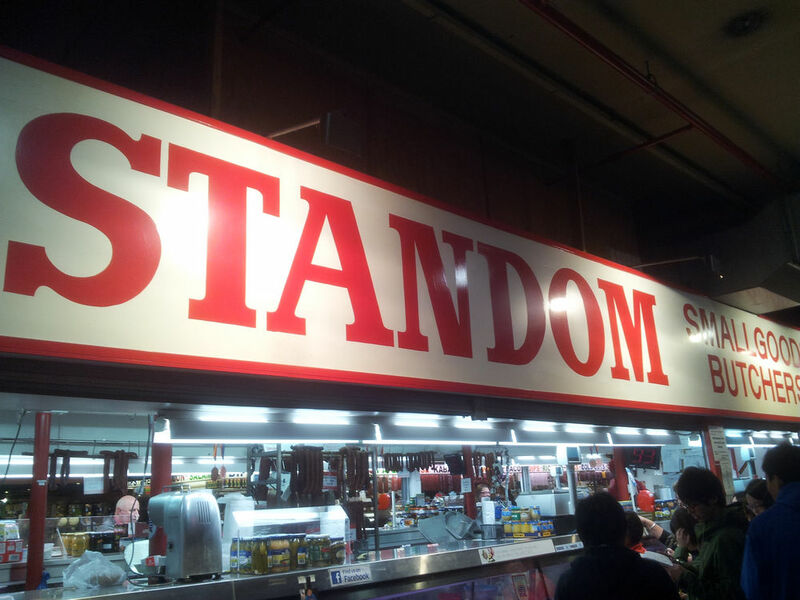 Located in the middle part of the Market, Standom is another expert in sausages. 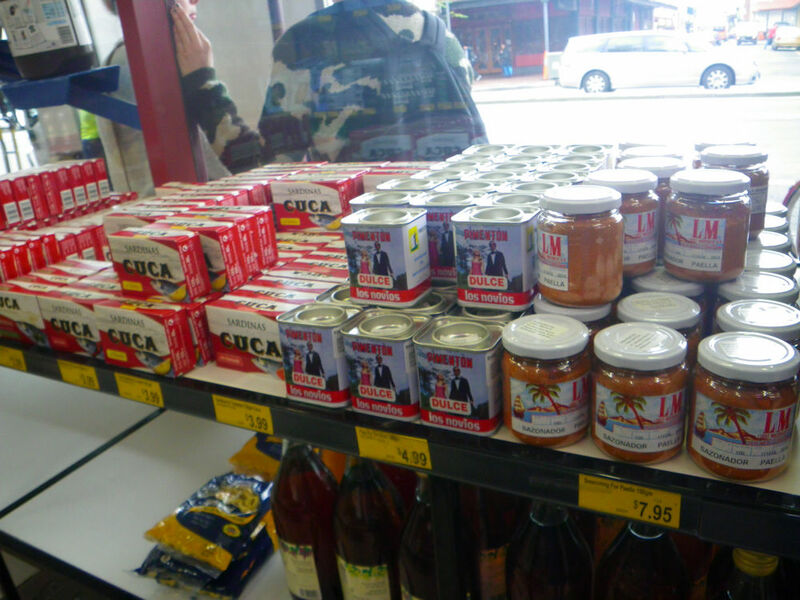 Of course, the store also has large amounts of smallgoods. Hence, this will be covered further in later sections, ie. smallgoods section. Standom was established in 1978 and has now been over 30 years in providing Adelaide with their products. 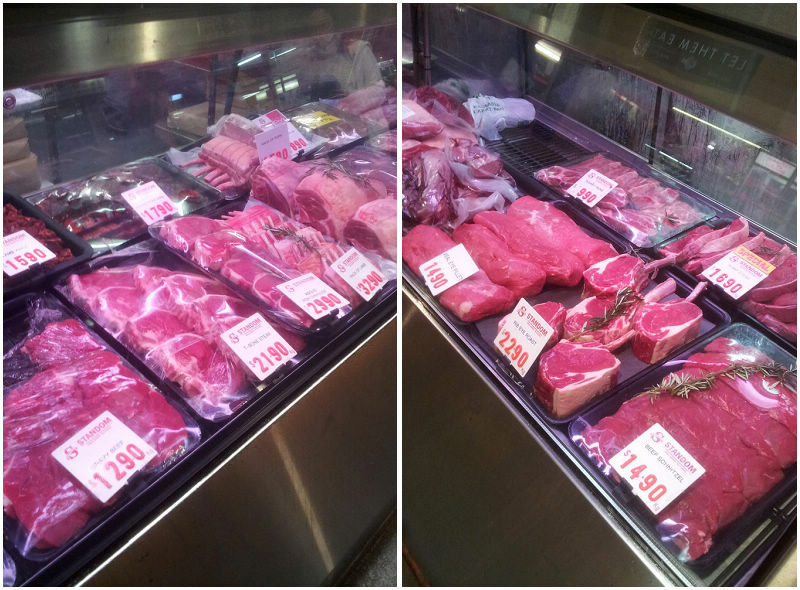 They have a meat butcher section on display and shoppers can easily find what they need. From pork and beef to lamb and chicken and even some marinated meat, Standom is a popular destination true foodies would visit to indulge. While I was there on a Friday morning, the store was very busy with loads of customers coming every several minutes. The store has broad ranges of sausages. Market goers can find sausages made with various meat, such as pork, lamb and so on The store manager shared that their most popular products were, in fact, pork sausages, which were made using 100% South Australian pork with no fillers. 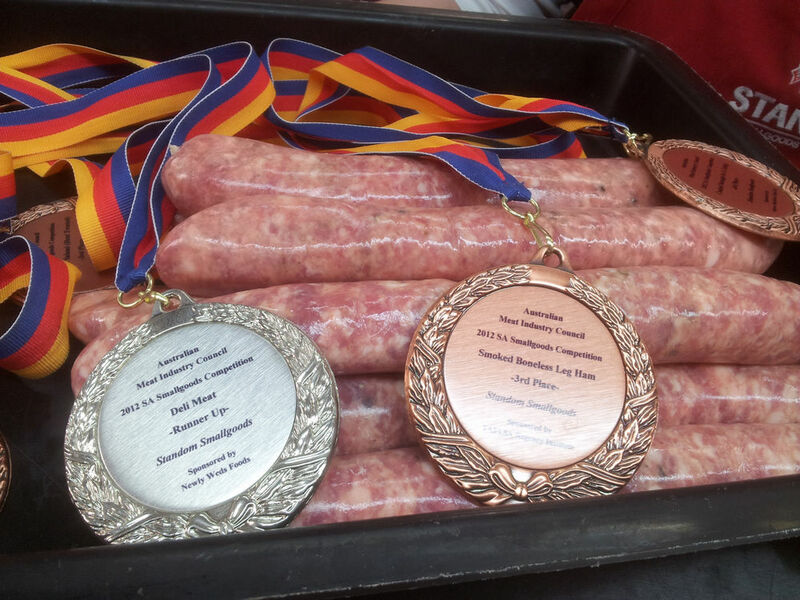 Standom has won numerous amounts of awards since opening on their sausages. 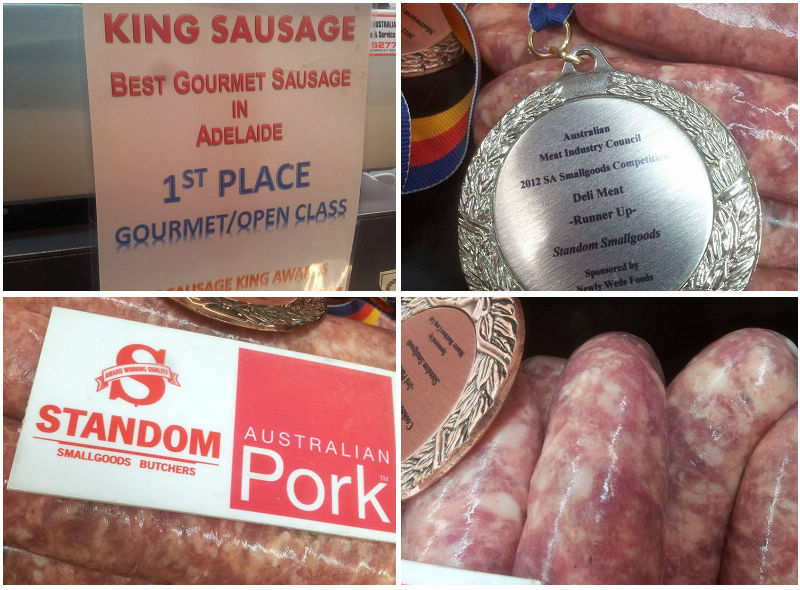 The most recent one is the First Place in the 2013 Sausage King Awards for their king sausage as the “best gourmet sausage in Adelaide”. The sausage looks pink on the outside with that big beautiful meaty feeling and is indeed yum! I got some of the king sausages and some speck portion. On the second morning, cooked Tina a pan-fried sausage with speck and scrambled egg. It was sensational and divine! The meat, after cooking was very tender and juicy. The pork itself was extremely tasty with heaps of flavours and was well balance with salt. The speck was cut into small pieces and stir fried with the sausage and the good thing was that all speck flavour and smokiness has gone well into the sausage. Yummo! 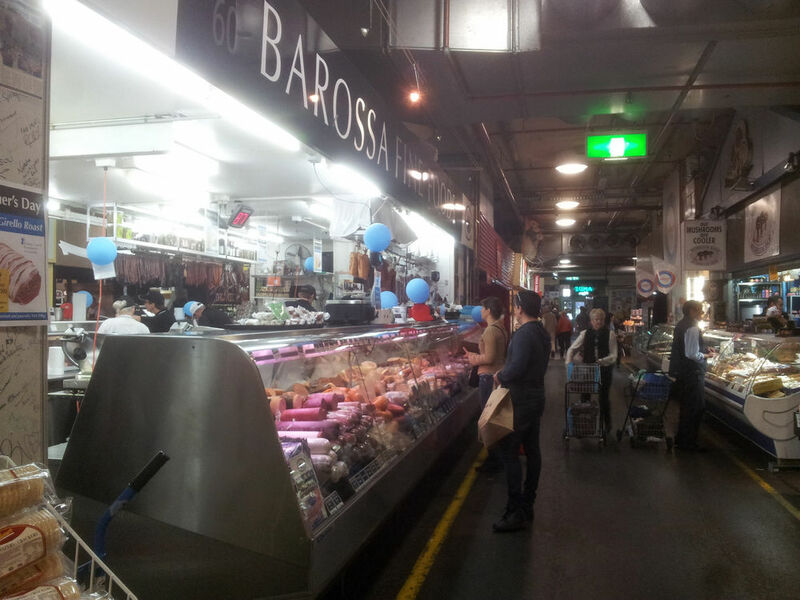 In Adelaide, when it comes to German and European styled smallgoods, Barossa Fine Foods needs no further introduction. They are my favorite smallgoods in Adelaide but do you know they also operate a fresh meat butcher? They have beef, lamb and pork meat and different cuts for retail as well as a huge selection of fresh sausages including my favourite wagyu sausage. This 4 generation store has operated in the central market for over 22 years and now has 8 outlets across the state. All products and produce here are locally sourced from South Australian farms. 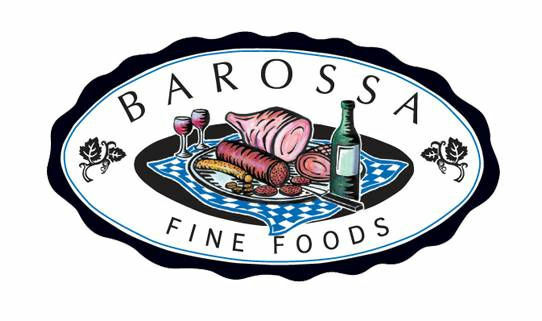 Since Barossa Fine Foods are more famous for their smallgoods, they will be covered more in later section. ie smallgoods. G’day and great write Xin, true! My favourite sausage maker among the three is Standom. Their sausages taste exactly how I want them to be. Interesting post. The varieties of stores are really all what I love about the central market. Looking forward to reading your future posts. I got the balsamic glaze and it tasted so good! i love this kind of review, well done my friend!